Age Related Macular Degeneration is a painless, gradually progressive condition that affects the retina, the light sensitive tissue in the back of the eye. 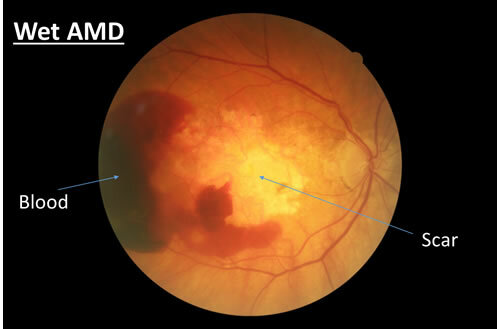 Age Related Macular Degeneration (AMD) affects a small central area of the retina called the macula, which is responsible for sharp, detailed vision. Over time, the cells in the macula degenerate, leading to central vision loss. 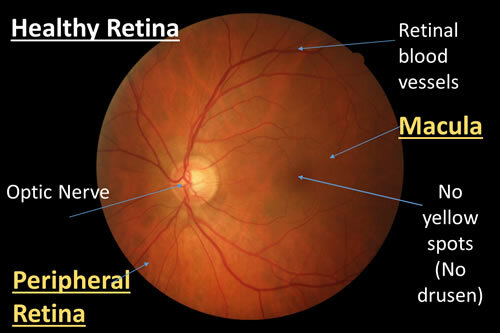 What part of the Retina does AMD involve? The specific region of the retina that is affected in macular degeneration is called the macula. The macula is responsible for sharp central vision that is needed for reading, or seeing detail clearly. The peripheral retina, which is responsible for wide angle vision, is not affected. This is why patients with macular degeneration may have a hard time reading a newspaper, but have minimal trouble using their side vision to walk around, even in unfamiliar surroundings. In the United States, AMD is the leading cause of severe vision loss in adults over the age of 60. The Centers for Disease Control and Prevention estimate that 1.8 million people have AMD with associated visual loss. The number is expected to grow to almost 3 million by 2020. Risk factors for AMD include age, genetics, and environmental and behavioral factors. 1. AGE: 75 million people over age 40 have AMD, and the prevalence increases with age. About 5 in 100 people over age 60, and 1 in 8 people over the age of 80 have AMD associated with severe visual loss. 2. GENETICS: Caucasians are far more likely to have AMD than other groups. There is increasing evidence genes in the inflammatory pathway, such as Complement Factor H are involved in AMD. 3. ENVIRONMENTAL and BEHAVIORAL FACTORS: Cigarette smoking, high blood pressure, overexposure to sunlight and poor diet have all been associated with AMD. In AMD, yellowish deposits called drusen form under the retina, the light sensitive tissue in the back of the eye. 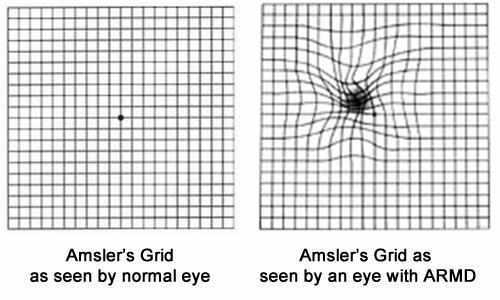 The drusen usually affect the macula, the part of the retina used for sharp, detailed vision. Over time, these deposits can increase in number, and can lead to damage or death of the cells in the macula, leading to decreased vision. AMD leads to painless changes in central vision. Early symptoms include visual distortion, where straight lines can appear wavy or crooked. There may be a blind spot in the center of your visual field. 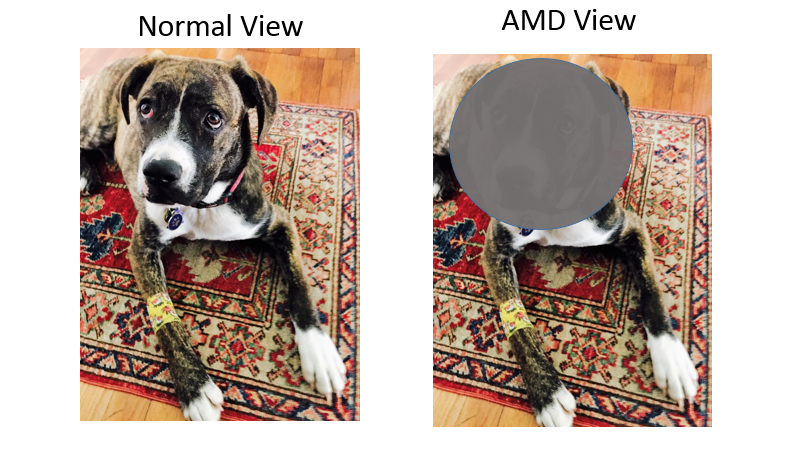 Are there Different Types of AMD? There are two different types of AMD: Dry AMD and Wet AMD. Most patients have Dry AMD and about 10%-20% of patients will have wet AMD. In Dry AMD, yellow deposits called drusen slowly accumulate under the retina. Over time, the number of drusen may increase, and this can lead to changes that cause damage or even destroy the cells in the macula. Depending on how much damage has been done to the cells in the macula, vision may be affected to varying degrees. 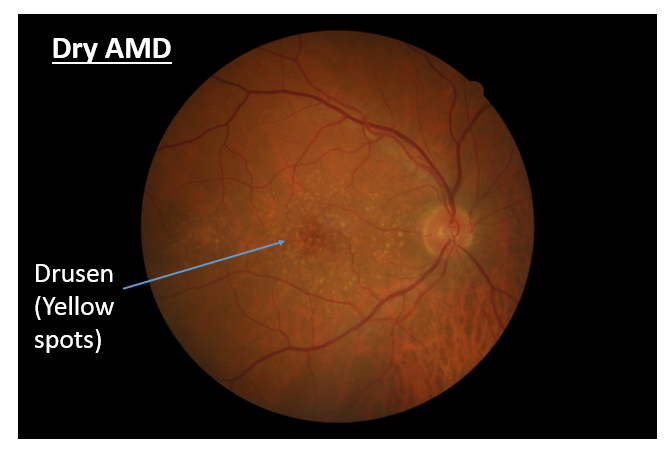 Dry AMD may be a precursor to wet AMD. Wet AMD occurs when abnormal vessels start to grow under the macula. These blood vessels can leak both blood and fluid. When this happens, it causes damage and can destroy the light sensitive cells in the macula. This can lead to painless, sudden loss or a decrease in central vision. This is a non-invasive test that takes pictures of your retina. This is a non-invasive test that uses special light rays to scan the retina. It allows your doctor to study the various layers of the retina in great detail. It also collects “3D” information about the macula, and can show if the retina is thickened or damaged. 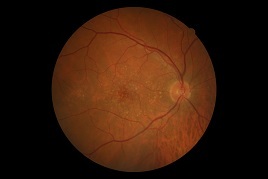 An OCT is used to both diagnose and monitor various diseases that affect the retina. If wet AMD is diagnosed or suspected, your retina specialist may obtain a special dye test called a fluorescein angiogram. For this test, vegetable dye is injected into your arm or hand. This dye will flow through your whole body, including to the vessels in your retina. 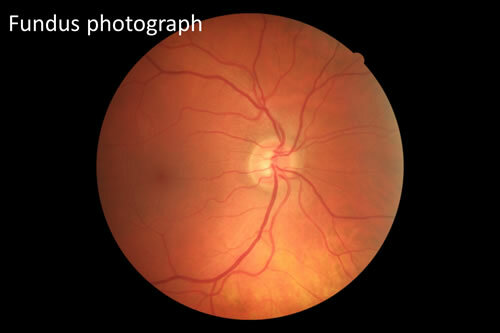 Using a special camera, your retina specialist will be able to study the vessels in the retina and see if there are any areas of abnormal leaky blood vessels. Your retina specialist will then discuss the findings of the clinical examination and tests with you and will discuss treatment and management options. At Retina Consultants of Boston, we provide best in class care, using all the state of the art technology and medications to give you the best opportunity of preserving your vision.